I was talking with some folks over lunch about past phone’s I’ve owned. I’ve raided my memory and decided to put up ‘my history in phones’. What do you think? All I remember about this was it came free when you saved up enough Coca-Cola ring-pulls. Thankfully a friend of the family drank a lot of Coke. Back when this came out, all a phone could do was literally make calls and send texts. Unusual for its time, this model could store SMS in its own internal memory as well as on the SIM. Wanting something a bit more stylish, I blew one my early paycheques on this baby. It made calls, and could send and receive SMS. It had a cool little ‘Bick’ came too. The vibrate motor was pretty substantial. Realising everyone else in my family (and the world) seemed to have a Nokia, I went for the 3330, they must be good – right? The 3330 was to the 3310 what was the iPhone 5S to the iPhone 5 – more memory and WAP in this case. More memory meant more space for custom icons, WAP meant getting football scores from the BBC on your lunch break. Nokia had the best interface and the best battery life, so I stuck with them for my first colour phone. No camera, the colour screen was only for receiving MMS messages as I sure was going to be sending any without a camera. It used to lightup like a nightclub when it rang, great phone and served me well for many years after as a ‘backup phone’ for taking to festivals and places where it’s likely to get ruined. While it might be cool to have the biggest phone possible these days, back in 2004 having the smallest was what it was all about. Not much of a change from the 3510i except mobile browsing was improved, and it let me share internet out to my PDA via infra-red. While I had enjoyed my first foray into smartphones, I the 6630 was underpowered and something as simple as opening the Contacts app would take about 10 seconds. So I decided to switch back to a ‘classic’ Nokia. By now Series 40 phones had quite a few smart features themselves: background email checking, mobile web browsing, ‘Push to Talk’ to name a few. The geek in my needed a smartphone, this one ran Windows Mobile 5. It was very cool, it had a full keyboard and meant you could do really advanced things for the time such as connect to a WiFI network (! ), crop photos, run an RDP session to your PC and edit Office documents. Unfortunately unlike a Nokia, the alarm could not be relied upon to wake you up in the morning – it would regularly fail to go off or crash. 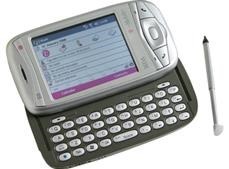 I remember spending a lot of time hunting for jobs when I had this phone, and having a decent email client really came into its own. The stylus used to keep falling out, eventually I lost it I think. This was the phone to beat all phones: WiFi, GPS, HD Video and 5MP Carl Zeiss camera with an optical zoom (not just digital zoom as most phones to this day still have). The podcasts app was great, so was email and browsing the web (it would show desktop sites and allow you to zoom). It did get slow after a few years of use however, and the volume up button broke twice for me (after 1 replacement). This made me decide not to go with Nokia again. Probably my favourite phone looking back, because it did change the way I used my phone. I already owned a first generation iPod Touch, and so I was completely sold on iOS. The App Store, easy video editing, games – everything was a joy to use. For the first time I would use my phone instead of a laptop for casual web browsing. Not to mention it was also an iPod. Brilliant, although iOS 4 did slow it down somewhat, it was at its prime when running iOS 3. I thought it’d give Android a try – everything was just slower, uglier and less reliable than the iPhone. After about 18 months using the HTC, I just had to jump ship and go back to iPhone. It’s easy to use, the battery lasts forever and it has more apps that I could download in an entire lifetime. I’m undecided on iOS 7, although I’ve yet to use it day-to-day. Looking forward to installing it, although I will probably wait a month or so for the bugs to be ironed out. Whatever happens my current phone will have to last me least another 18 months, whether I get the iPhone 6 or switch to Windows Phone 8 depends… all I know is that I’m unlikely to switch back to Android – although I would consider a Nokia again, having played with some of their newer (much more sturdy) phones.